This summer my husband Robin and I are planning to go to the Netherlands for our daughter's wedding. We decided to combine this with a trip to Rwanda. We are joining Grace Rwanda to conduct librarian training for approximately 30 librarians in Rwanda. 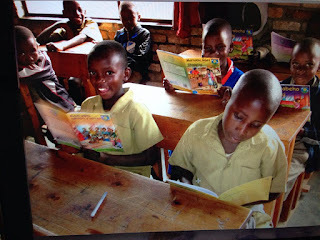 Grace Rwanda (GR) is a local organization that promotes literacy in this small African country. The organization was founded by Rwandan Tutsi Genocide survivors Elizabeth Johnson & Marie-Louise Kaligirwa. includes Mary Jo Ohl, a retired teacher librarian, two library technicians--Erica Taylor and I. My husband who will help wherever he can (he is a great help with computer related stuff, he is a handyman and of course he looks forward to reading One Eyed Jake to the kids!). We plan to train 30 employees/volunteers of the 22+ libraries that Grace Rwanda has set up. This training will benefit the communities that the libraries serve. Grace Rwanda with the help of Rotary has shipped over containers of donated books and they recently partnered with Book Aid International who will ship containers of brand new books from the United Kingdom. BAI will also share their library training materials with our team. We aim to raise $5000 CDN to facilitate the training seminar. The trainee librarians work as volunteers or receive $50 per month for their wages. We plan to cover the cost of the trainees to travel to Kigali, their lodging food and training materials. Thank you for reading this blog post. 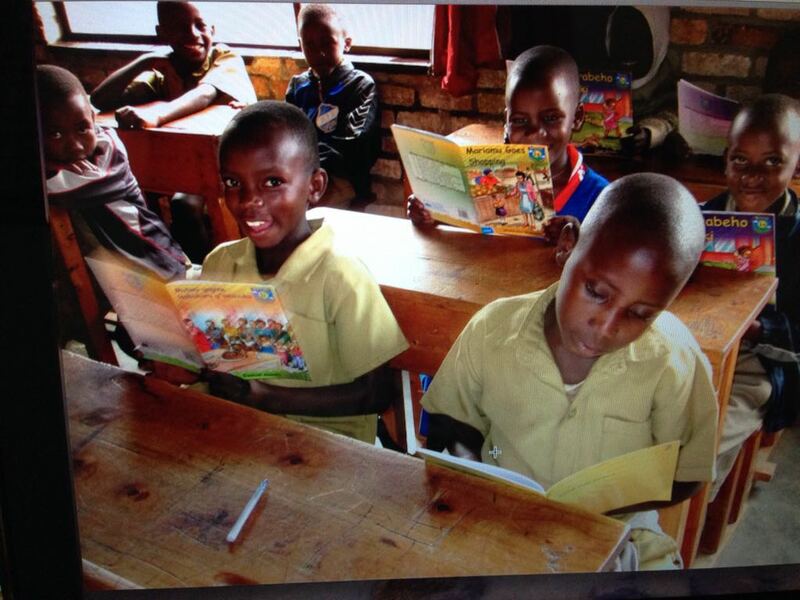 We are excited about making a difference to literacy in Rwanda. "Little by little the bird builds its nest"
This Haitian proverb seems relevant to the project I was able to join in September 2014. 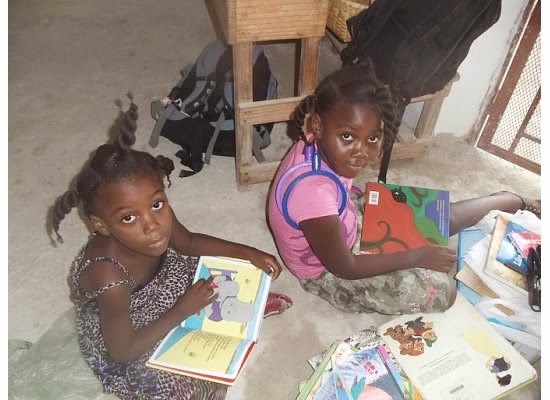 With the organization Hearts and Hands for Haiti - we set up a school library in Tarasse near Gonaives, Haiti. Now 400 children have a library full of books to increase their learning and fuel their imaginations. It's a little library, but it is a start. 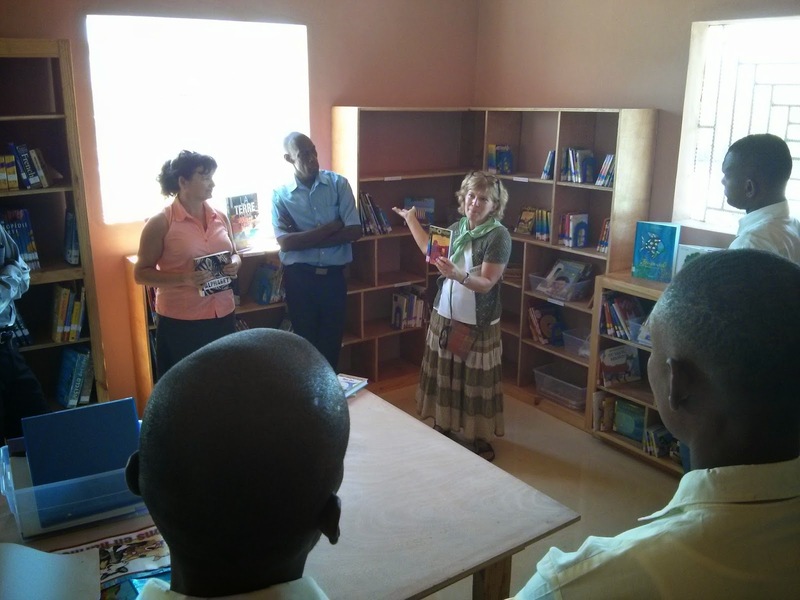 Tarasse School, Haiti now has a library. As we were giving the teachers a tour of the library, they expressed great joy at having all these books to use. One teacher asked if we could return to give instruction on how to incorporate the books in their classroom instruction and principal Cherismond Delva, said that he had never dreamed that he would have such a library at his school. Our team --6 people from Raleigh, NC and me the sole Canadian, arrived at Tarasse School to find out that the library--on the 2nd floor-- wasn't ready. The roof had to go on and the shelves needed paint, construction dust was everywhere. But that didn't stop us. Our team set up a work room in one of the new classrooms downstairs. We cataloged approximately 650 books--many we had brought with us and some books were from Cherismond's office. We worked hard in 32-35 degree heat and high humidity. We had battery operated fans to help move the air around--all I can say is--it was really hot and muggy but everyone was cheerful. In 2010 I went to university to earn a Library Technician diploma. The main reason was so that I could help set up a library with Seeds of Hope Children's Ministry in Zambia. 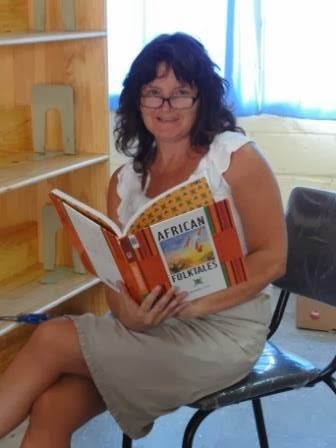 Through my school at UFV I connected with Paula Lindsey, another student in the program who helped to set up a library in Haiti with the non-profit organization called Hearts and Hands for Haiti (HHH). I contacted Paula to see if we could compare notes about our experiences, we had a good visit and discovered a similar passion for library work in developing countries. Last spring Paula invited me to go with her to Haiti to set up another school library at Tarasse school. It didn't take me long to decide I wanted to go. As it turns out Paula can't make the trip this time but I am leaving September 20th and will return October 4th. I am joining a library team from Raleigh, N.C. 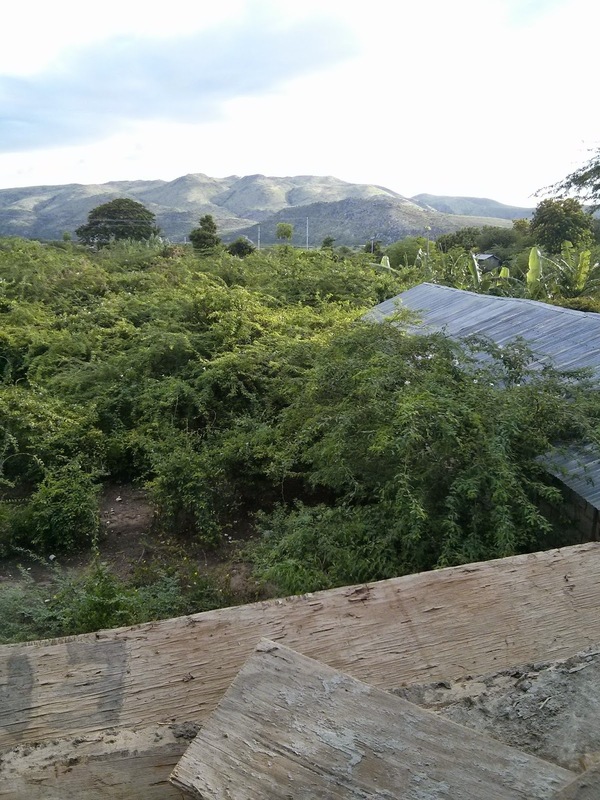 I don't know a lot about Haiti as I've spent more time learning about and visiting Zambia. I did read Paul Farmer's biography Mountains Beyond Mountains by Tracey Kidder. I recommend this book for anyone who is interested in learning more about Haiti, global health, tuberculosis and anti-retro viral medication distribution in the developing world. Paul Farmer founder of Partners in Health was instrumental in making ARV's freely available in developing countries that have been ravaged by HIV/AIDS. The first school library, Siloe Mission School in Poteau was set up in 2011, now a second library is going to be set up in Tourasse . This library can potentially provide books for 500 children. I am collecting books in French, children's books, fiction and non-fiction. We will be setting up the library, cataloging the books, training teachers about library practices and reading to the children-in French. Every time I walk along the rolling hills of Westminster Abbey in Mission I feel like bursting into the opening song from Sound of Music “The Hills Are Alive”. The hills at Westminster Abbey are alive with monks working, visitors strolling and cows grazing the green pastures. Giant rhododendrons grow in the verdant forest (it all blooms gloriously in May) and the sounds of the steeple bells tolling regularly are reminiscent of church bells in a European village. When visitors, who come from all over the Lower Mainland and around the world, walk the grounds there is a good chance they will pass a monk or two. Guests come to admire the beautiful church with its spectacular stained glass windows, built by Norwegian architect,Asbjørn Gåthe, and they come to admire breathtaking views of the Fraser Valley. Walking to the southern lookout you can see the meandering Fraser River, and look to Abbotsford and Mt. Baker, and in the east Mt. Cheam in Chilliwack. My interview with Father Abbot JohnBraganza was on the feast day of St. Benedict, and we had a short time between the morning service and midday prayers. Arriving as people were leaving the church, it seemed like everyone wanted to talk to the abbot. The monks at the abbey follow the rule of St. Benedict, a document that was written in Latin (80 per cent of which is Scripture) around 480-597 AD. St. Benedict’s Rule for Monasteries has been translated into many languages and revised often to accommodate modern rhetoric. The rule book outlines the rules of monastic life which this community of monks live by. There are also 200 to 300 oblates – lay people who are not monks but associate themselves with Westminster Abbey—who live by the rule of St. Benedict as well. The rule book includes guidelines for life through work, study, private prayer, common prayer and rest. The lifestyle of a monk may appeal to some as being restful, yet the days are busy. “We all work about six hours per day,” says Father Abbot. Breaks during the day include time for prayer and meals. The Seminary of Christ the King, first founded in 1939 in Ladner, BC, is now operated at the Abbey in Mission by the monks who live there. There is an all boys’ high school teaching Grades 8 through 12 and an accredited college where degrees can be earned in arts, theology and divinity. Some laypeople teach at the school. The abbey also has 36 rooms available for guests who want a quiet retreat from their regular lives. “Some people book a year in advance and come back every year,” says Father Abbot. Everyone eats together in the dining room and may join in with common prayer. The monks are at peace, living all their days in community together, while professing faith, hope, and charity, existing obediently and monastically. The original story I posted about why I became a librarian got deleted so I am posting the story again using an article that was published for an online magazine in Australia. 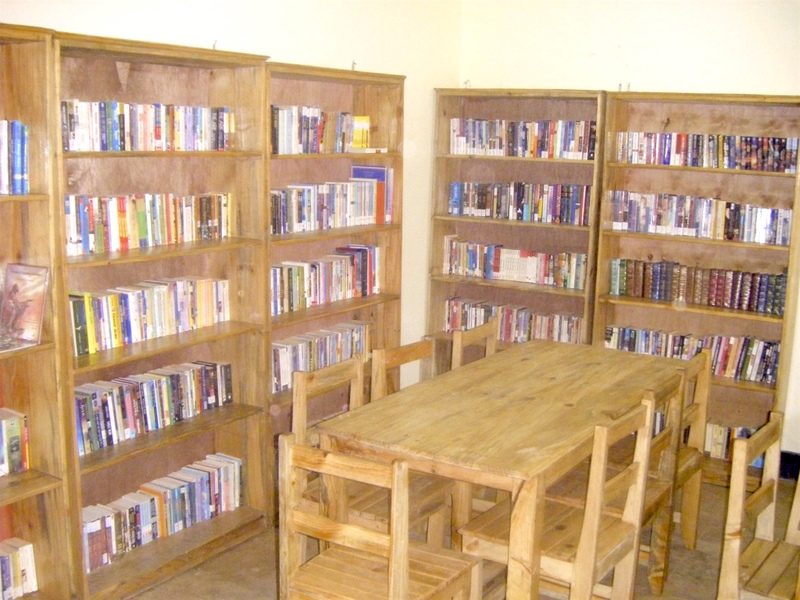 School libraries in Zambia are about as common as giraffes in Canada. If you look in the right places you can find them but they are not naturally a part of the environment. 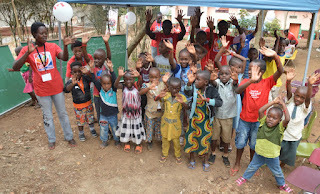 In 2009, Seeds of Hope Children's Ministry, the Canadian NGO that I am affiliated with was building a school for more than 120 HIV affected children in Ndola, Zambia. [i] I volunteered to set up the school library. Since I didn't have any librarian training, I registered for the Library and Information Studies program at the University of the Fraser Valley in Abbotsford, BC. In June 2012 I received my Library Technician diploma. After much packing, planning and organizing Grace Academy High School now has a well equipped school library. Seeds of Hope (SOH) looks after children affected by and infected with HIV. Caring for these children is an insurmountable task that includes medical care, food, housing, education and most of all love. It was a privilege to be involved in the task to set up a library for this special group of children. I have made yearly trips to Zambia since 2001 when SOH established a home for children orphaned by the AIDS crisis. During the first years we were more concerned with giving the children quality of life before they succumbed to illness as a result of AIDS but in 2004 anti-retro viral medication drastically changed their circumstances. Children who weren't expected to live into their teens became healthy and began to thrive. SOH had to start planning for the futures of these children. They established a boarding school called Grace Academy on a 55 acre plot of land just outside of the city of Ndola in the Copperbelt region of Zambia. This Zambian grandmother cares for 11 grandchildren. A library isn't the most pressing item on the list when deciding how to help orphans and vulnerable children (OVC's) in a developing country. But we all know that once the very basic human needs of OVCs are met there is a need for education and information to provide hope for a future. 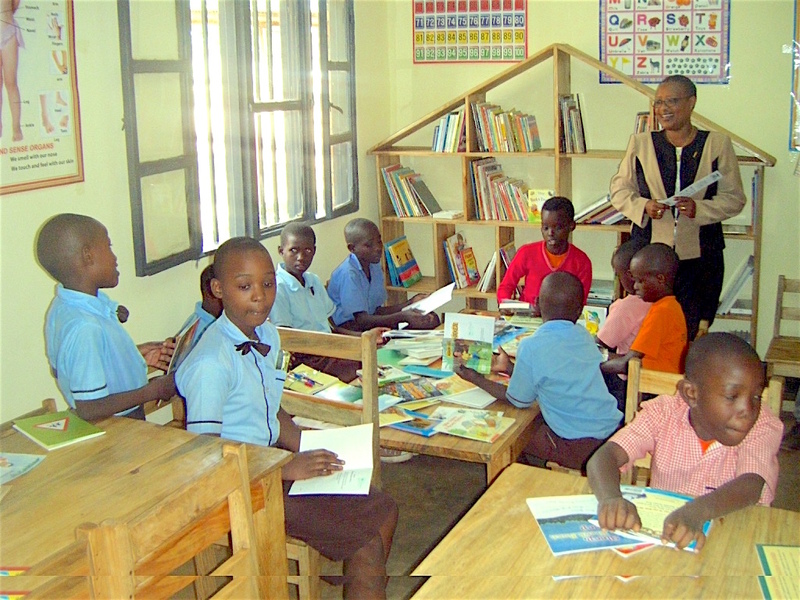 A well equipped library is an integral component to providing a good education for children. Unfortunately there is an extreme lack of libraries in Sub Saharan Africa, including Zambia. I am convinced that libraries have an important role in alleviating poverty in countries like Zambia. I wrote a research paper about this that I presented at the Pan-African Reading-for-All Conference in Botswana in June 2011. Funding for libraries is almost non-existent in public schools in Zambia and if a school does have books they are often locked up for safe keeping. One school—Baluba Basic School—near Luanshya has 1,000 pupils and only 800 books. This means if 800 students each take one book home, 200 children are without a book. When I visited this school and asked to see their library I was told that the room was locked and the teacher with the key was absent. For Grace Academy library we collected approximately 8,000 donated new and gently used books in Canada. Volunteers helped me sort through the donations and divide the books into fiction, non-fiction, reference and textbooks. We packed the books into 110 banana boxes collected from grocery stores (banana boxes are sturdy, stack well and are uniform in size). We kept a general record of the titles we packed but we did not have time to make a detailed list. Ideally I would have liked to catalogue the books before shipping but a container became available sooner than expected and there was only enough time to pack up the books. 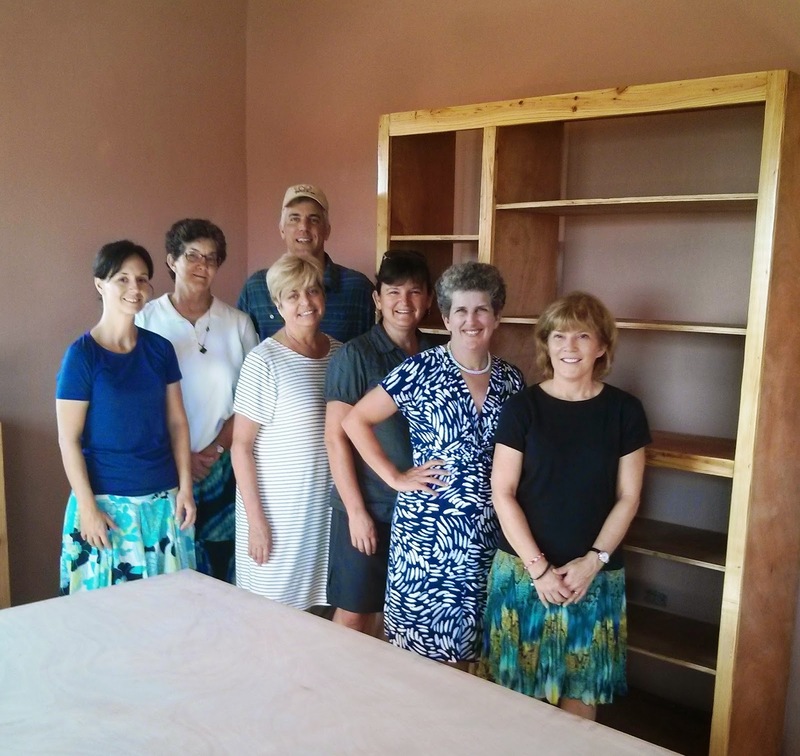 In September 2012, a team of eight volunteers—two of us library technicians and the rest willing helpers—travelled to Zambia to set up the library. We had two short weeks to get the books on the shelves, start the cataloging and hire a librarian. We spent time organizing the books, stamping, sticking on spine labels and barcodes and taping. We had brought all of our supplies with us, including book ends. 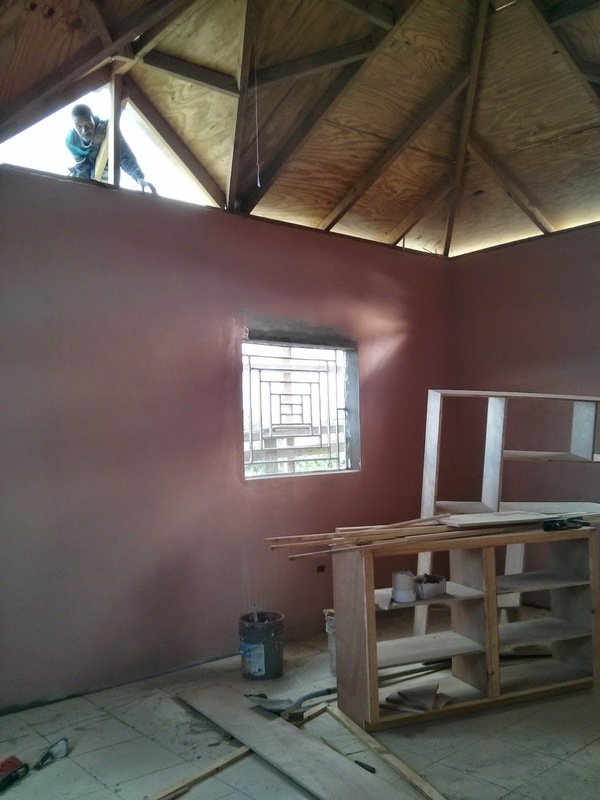 Meanwhile carpenters were still finishing some of the shelves and building the desk for the librarian. We chose to use an open source integrated library system called OpenBiblio, designed for small libraries it was fairly easy to install and it was free. There was no internet available so we could not import MARC records. We had refurbished bar code scanners and one of our team members donated a laptop. We also managed to purchase a printer/photocopier in Ndola. The library room is part of the annex of four laboratory rooms across from the high school, this room is a perfect size, has windows, electricity, a secure door and a good roof. One of the big questions we had when planning our trip to Zambia was will we be able to hire a librarian? Finding and hiring a librarian in two short weeks in Africa seemed difficult to do. Anyone who works in libraries understand how important it is to have a librarian to connect the resources to the patrons. We wanted the library to come to life and be a vibrant component of the school. I sent out an email to the IASL International Development SIG and Dr. Barbara NcNeil, University of Regina connected me with Mary Chipanshi, Nursing Liaison Librarian at UOR. Mary Chipanshi contacted her niece who works for a company in Zambia, she gave my information to the records manager, Lazarous Musitini who made arrangements to meet me at our project. Mr. Musitini brought Mwansa Mwape, a recent library studies graduate from the University of Zambia. I am grateful for the IASL SIG group that made it possible for me to connect with Mr. Mwape and we were extremely pleased to hire him. He began his librarian job immediately. When we interviewed Mr. Mwape for the job, one of the most important questions was What do you think about having a large part of the collection being made up of fiction books? This question came to our attention after another Zambian librarian who was helping us declared we had far too many fiction books for an academic library. I had to explain that in North America we encourage students to read a lot of fiction knowing that in order to create life-long readers we must instill a love for reading in the children. When children read for pleasure they naturally become better readers. Zambian acquaintances have told me that reading is considered an activity for academics—the idea of reading for pleasure is not part of the Zambian culture. Mr. Mwape told me that he had been taught by a professor from America who explained the importance of encouraging reading for pleasure. Guiness Book of World Records was a hit. The library is now open, the librarian is cataloging the rest of the collection and he is training the volunteers. 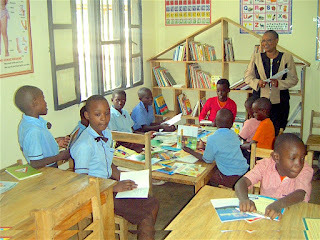 Best of all he is facilitating the borrowing of books and encouraging the children to enjoy reading. While we were setting up the library we let the students help us, this made our job busier but the reward was watching the children as they would work on a book—they would eventually take a second look at the book they were working on and start to get absorbed with the content. I am thrilled to think about the possibilities that are in the library, the potential for learning and creativity that can be sparked and the love for reading that is now being passed on in a part of the world where a library did not exist before. And that is why I became a librarian. When Cindy Wade began working at North America Indigenous Ministries (NAIM) based in Abbotsford, she had no idea that NAIM had a connection to her mother that dated back almost 60 years. It wasn’t until Cindy started reading the book Blessings of Obedience by William W.Lottis, that she read something familiar to her. The book tells how NAIMwas started by a seafaring missionary called Cap Stabbert and his ship called Willis Shank, named after a man who died at age 31 while bringing the Gospel to the indigenous people of North America. The Willis Shank went to all the communities up the coast with the purpose of ministering to the aboriginal people who lived in isolated towns and villages. The ship was equipped with medical and dental services, staffed by doctors and dentists, but the main purpose was to bring the Gospel to the people. Maryann’s parents ran a Sunday school but had no real fellowship with other believers. “There weren’t other Christians in the community so that gave us a real link.” When the Willis Shank came in, a service was held on the ship that was open to anyone who wanted to take part, and Maryann did just that. “That was where I accepted Christ as my saviour.” She was 10 years old and the moment is indelible in her mind as the moment when she was saved. “Then my dad was baptized by CaptainStabbert in the ocean.” This memory is precious to Maryann especially since her dad passed away from a heart attack when she was only 11. Shearwater, a former air force base, had a sawmill and, in the summer,gillnetters and trawlers. Maryann’s dad was the accountant at the marine works, and the family lived in Shearwater for three years without ever leaving it. “Shearwater had no real amenities – a little tiny store but you wouldn’t get fresh milk or anything, that had to come up from Bella Bella, we would have to get a boat and go over and get our groceries,” Maryann recalls. There were 10 to 12 kids in the whole community, they were taught in a one-room school. When children reached Grade 9 they had to move to Bella Coola to attend high school. Library books were shipped in from Vancouver Public Library. Because it was a former airforce base every house had an air raid shelter in their backyard and the children would play in the old mess hall. “We would lay plywood down and roller-skate as much as we wanted.” There was no electricity, the town was powered by a generator. Maryann loved her life there—the freedom and living by the ocean. This story comes full circle when, 60 years later, Maryann’s daughter Cindy began working for NAIM. Maryann, who had retired from working at the Surrey School District, enjoyed helping out at the office. “I volunteered at NAIM for two months, from there they asked me if would be willing to work for them.” Maryann worked in the accounting department and filled in for the receptionist when needed, but she recently retired due to health concerns. Maryann remembers the excitement when missionary ship the Willis Shank arrived in Shearwater, and she remembers the song Jesus Saviour Pilot Me; the words ring true as God’s faithfulness is evident. He has been leading Maryann from the time she was a little girl, giving her heart to Jesus on a ship, to 60 years later working for the same ministry that is still faithfully bringing the Gospel to indigenous people in North America. Occasionally I write articles for the Light Magazine a monthly Christian magazine that is published in the Fraser Valley. I enjoy meeting the people and interviewing them about their interesting lives. Last month I met Stuart Spani and interviewed him at Central City mall in Surrey. It happened to be his 81st birthday. Stuart was funny and energetic and he is tirelessly raising funds to stop malaria from killing people. Visit his website Malaria Defeated and read the story below, pass along this information to anyone who can benefit from this. Missionary Stuart Spani outside a ZoClinic. Malaria is deadly – a child dies of it every minute, and it kills 3,000 people every day. Those who do survive suffer from its effects: a weakened immune system and days of feeling achy with pounding headaches. Most of the world’s malaria deaths occur in Sub-Saharan Africa. North Vancouver resident Stuart Spani is dedicated to eradicating malaria, village by village. He compares the number of fatalities from this disease to having a 911 terrorist attack daily. Spani is working on a project to set up treatment clinics, called ZoClinics, to wipe out malaria. The clinics were started nine years ago. At a cost of only $400 per clinic they operate with a three step plan: early detection; quarantine; and grow your own free medicine. Spani, who at 81 years old is still active in missions trips to end malaria, first got involved in 1996 when he heard a choir from Mizoram(a state in northern India) perform in Vancouver. He was so inspired by the story of Christian hope in Mizoram – “a community of over 700,000 people with no homeless, no starvation, no beggars and where all are literate” – he decided to visit. Spani was 64 years old when he went on his first missions trip to India. In Mizoram Spani met Malsaum Dawng Liana (Dawng) a man studying to become a doctor. Dawng had suspended studies after his father died of malaria, to take care of his family. After six more people in his village died of malaria, Dawng created the ZoClinics, setting up the first one in his village in 2004. Since then no one in his village has died of malaria. Spani was so impressed with the effectiveness of the clinics that he partnered with Dawng to raise funds to eradicate malaria village by village in India and around the world. The plan is simple and inexpensive, yet life-saving. When a ZoClinic is set up in a village, a local person is trained as a technician to identify malaria using a microscope. The technician visits each house to describe the early symptoms of malaria (headache, fever and vomiting) and he tells people to come to the clinic right away if symptoms appear. If the test is positive the patient is treated immediately. Malaria treated within 24 to 48 hours has a high cure rate. Malaria is spread when an infected person is bitten by a mosquito and that mosquito passes on the larvae to another person. Patients are isolated under a mosquito net at the clinic to contain the infection. Many poor people cannot afford to pay for nets or malaria medication—they may purchase less expensive (and less effective) medication and usually quit when the symptoms disappear, which is too soon to be malaria free. This results in loss of work for several weeks and sometimes death. But the ZoClinics dispense free medicine—a bitter tasting tea made from the artemisia plant. The Chinese have used artemisia for 2,000 years to treat fever; during the 1970s it was discovered to have anti-malaria capabilities. Drinking artemisia tea for five to seven days will cure malaria after which a second test is done to confirm the patient is malaria-free. Artemisia is easy to cultivate. “One plant can make 1,000 cuttings, producing enough plants to treat 3,000 people,” explains Spani. Spani is raising funds to set up clinics in all 55 malaria-prone countries in the world. In December 2012 there were 100 ZoClinics in India and in March 2013 Spani travelled to Africa with his grandson Mike to visit the 28 Zoclinics in Burundi, Rwanda and Zambia. Funds are in place for 28 more clinics in Kenya and West Africa while Spani is raising money for 50 clinics in various African countries. Spani is determined to use ZoClinics to take the deadly sting out of malaria by raising awareness and money. He is a living example that we are never too old to make a difference in the world. For Paris. For Beirut. For the grief of the collective and the individual.